The Bible verse above is printed at the top of the page in my gratitude journal that I just finished filling in. Back in August, I challenged you to take a journey of gratitude with me and keep track of the blessings in your life for which you are grateful. Though today marks the official end of the challenge, I hope it won’t bring an end to your list keeping. I’m up to #297 in my journal. Much of today’s list contains blessings from my adventure at Whole Foods a few hours ago. Yes, I braved a trip there the day before Thanksgiving. My favorite is #294: Whole Foods vegan pumpkin pie. Or maybe it’s #295: A quick parking space find at Whole Foods the day before Thanksgiving. I’m also grateful for getting to sit down for iced green tea with a dear friend yesterday (#286), as she shared with me how her own journey of gratitude has gone this month. She updated her Facebook status every day in November with something that made her give thanks. Some of these status updates were profound. Others, funny and light-hearted. She told me that one day had been so horrible for her that she couldn’t think of a single thing from the day to put in her status that wouldn’t have been fake. So that night, she posted that she was grateful for the promise of the next day, a promise that tomorrow would almost certainly be better than her day had been that particular day. We talked of how the practice of gratitude had changed us in subtle ways, made us more aware of all the many blessings in our lives. These are blessings that life’s difficulties threaten to overwhelm and make us forget, and by keeping a list, we became aware that they are even more precious for having taken a moment to stop and write about them – to call attention to them even when our spirits feel battered by trials and disappointments. For me, the gratitude list became a challenge to find peace on those bad days. I was forced to ask myself, “What are the positives, the blessings, that I can see in these circumstances?” Take #199 (just because my friend Tracey asked for this one in particular): “A delay that gives me more time to prepare.” I had been disappointed that some friends who were coming to visit for the weekend missed a connecting flight and wouldn’t arrive until the following morning, but their delay gave me more time to get the house ready. And I was grateful for the extra time that kept me from feeling frantic as I cleaned and ran errands before they arrived. There were especially good days when my hand hurt from writing such a long list, like this past Sunday after returning from a trip to South Carolina with my husband. I got to see trees draped in Spanish moss with sunlight filtering gently through, and it filled my heart with gratitude for the varied beauty of nature and the time I get to spend with my husband. 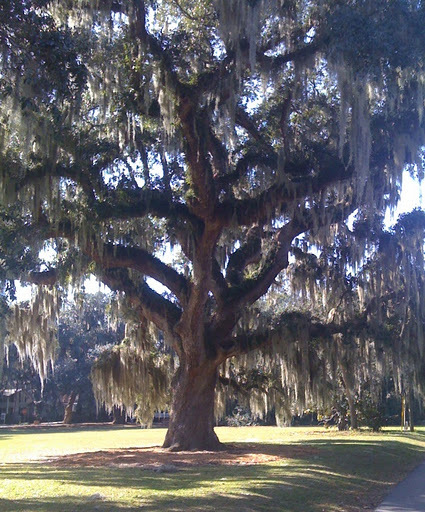 A beautiful tree covered in Spanish moss, #276 on my list. As Corinthians tells us, God’s gift can be indescribable, but I’ve found it worth the effort to attempt the description. The act of describing blessings keeps me grounded in a greater truth: the blessings God has given far outnumber and outweigh the trials. I trust you’ll hold me accountable by asking from time to time if I’m keeping up with my gratitude journal. And I hope you’ll keep writing your list, too. In that way, thanksgiving becomes a celebration of every day, not only the day(s) we fill ourselves with turkey and stuffing and green bean casserole … and pumpkin pie, too. Would you please share here what the Thanksgiving challenge has meant to you? Or maybe just one or two things for which you are grateful? Leave a comment here before next week’s post (Wednesday afternoon), and I’ll send one of you a copy of Ann Voskamp’s One Thousand Gifts. Before I close, let me tell you that I’m grateful to you for reading this blog and encouraging me. (That just made #298.) Happy Thanksgiving, my friends. Keep on giving thanks. This entry was posted in flourishing tree and tagged Ann Voskamp, gratitude, trees by hopesquires. Bookmark the permalink. Thanks so much to all of you for posting responses to this challenge, and also for those of you who tried to post responses but couldn't (blogspot can be so frustrating at times).Anyway, I loved all of your responses and ended up drawing a name at random to win a copy of Ann Voskamp's book. Bev, you're the lucky winner! Okay, so I didn't make Wed. afternoon BEFORE your latest post, but it is still Wed. afternoon! Anyway, as I said to you before, the practice of writing down something I'm grateful for every day has almost certainly made me live more fully in the present as well as actually pause to think about my gratitude for every little thing (like seeing on my GPS that my run was nearly a mile longer than I thought it had been) that I might have previously simply glossed over, not taking the time to acknowledge my gratitude for some little thing specifically. So thanks for that challenge! Because of missing the beautiful fall season, I am thankful for the lovely tree pictures you take and post for the rest of us to see!We are so thankful here in Florida that we did not get any hurricanes this year. We are thankful for my husband's recovery from his heart/kidney problems last summer. We are thankful that we do not have to be conformists or rebellious people but rather obedient servants of our God. How grateful we are that we can wish each other the Merriest of Christmases and do what we can to alleviate the pain of those who are suffering! May our strength come from above and may our hands reach out to bless others! You are truly an inspiration to your friends. Hope- your friendship is right there on the list, girl! You are a treasure, a blessing, and a very gifted writer.Thanks for the challenge! I'm glad I get to read your lovely blog and that I got to see you in the cafeteria today, Hope. I'm also glad a falling tree limb missed me while I ran today!